Paediatric Obstructive Sleep Apnoea is a common childhood sleep disorder that can affect your child’s brain and physical development. So if Junior’s been snoring in his sleep, get help now. 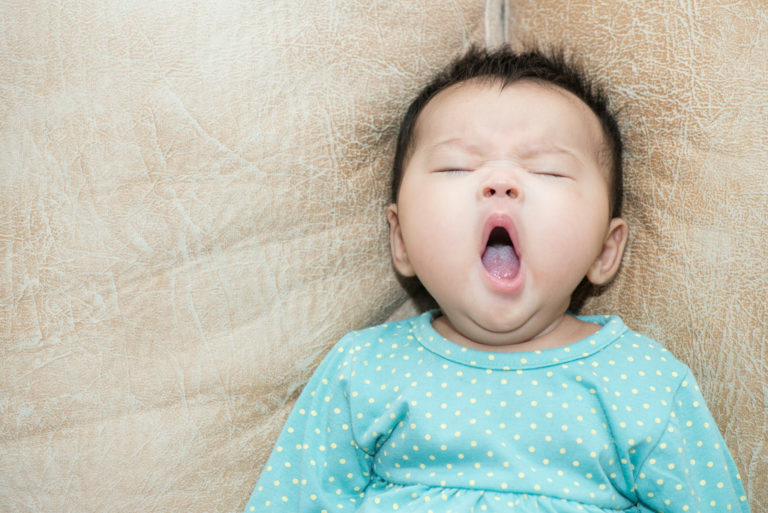 Kids look like angels when they’re asleep… and quiet. If yours is snoring like a tractor, it may be time to get a checkup. 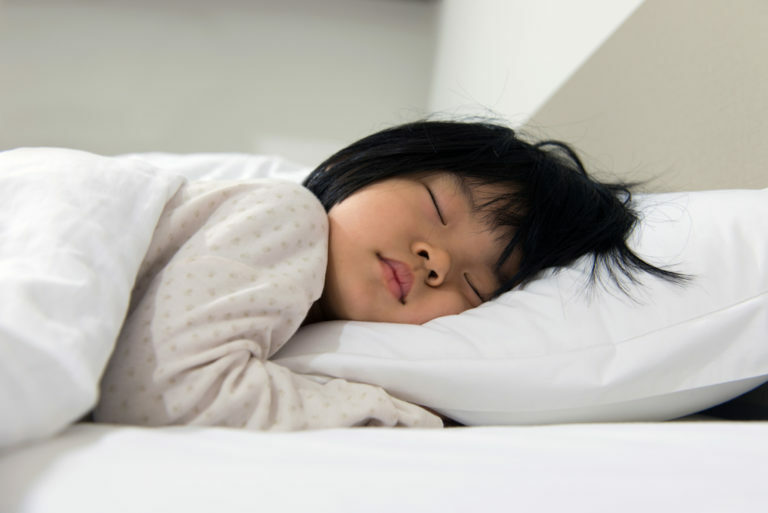 Your child could have Paediatric Obstructive Sleep Apnoea, a common childhood condition that affects over 11,000 children in Singapore, and which can can cause long term repercussions to their cognitive and physical development. The problem is that we can’t see things we aren’t looking out for. Like that one-dollar coin hidden in between the cushions of the sofa or old clothes piled up at the back of the wardrobe, Paediatric Obstructive Sleep Apnoea (OSA) can escape even the most vigilant mother’s notice. Paediatric OSA is characterised by frequent stoppages in breathing during sleep. It affects one to three per cent of children aged 2 to 6 in Singapore. This means there are between 400 and 1,200 new cases each year. That’s enough for medical experts to consider it a common problem. Yet research has revealed that fewer than one in 10 parents in Singapore can identify Paediatric OSA – not a good sign at all. Read on to find the signs that could indicate that your child has Paediatric OSA. Does my child have Paediatric OSA? 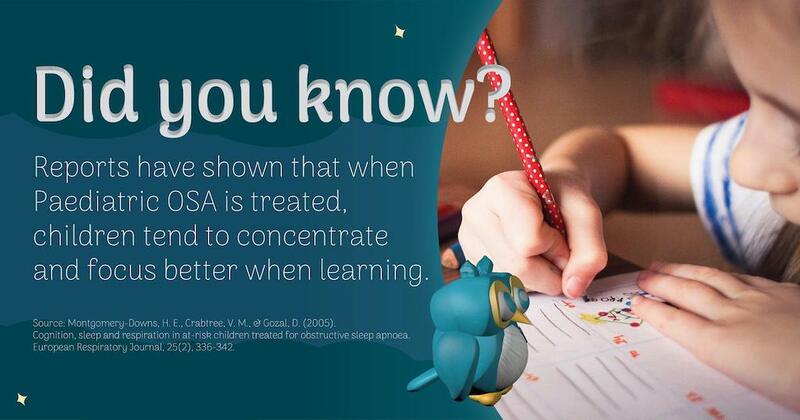 First of all, children affected by Paediatric OSA may be sleepy during the day. They may not focus as well as their peers, and thus learn at a slower pace. As childhood is a stage of important foundational growth, a child who is affected by OSA may suffer from impaired cognitive and physical development. So, what can you do at night to safeguard your child’s future? Learn to Do the O.W.L. Children suffering from Paediatric OSA have difficulty breathing during sleep. Hence, they will frequently change positions to keep their upper airways open. Observable signs include tossing and turning, and pillows and blankets strewn across the bed. You may notice a drastic rise and fall of the chest and stomach when your child is struggling to breathe, similar to a see-saw motion. After shifting multiple times, they may find a comfortable position to breathe. The position is usually unusual. Your child may over-extend his neck, sit up to sleep, or hang the head off the edge of the bed. These positions help open up their upper airways. This shifting of sleep positions repeats throughout the night. This indicates that your child is mouth breathing — probably because of an obstruction in the nasal passages. The easiest symptom to hear is habitual snoring, or snoring on at least three nights a week. This noise is created by vibrations as air flows through obstructed airways. 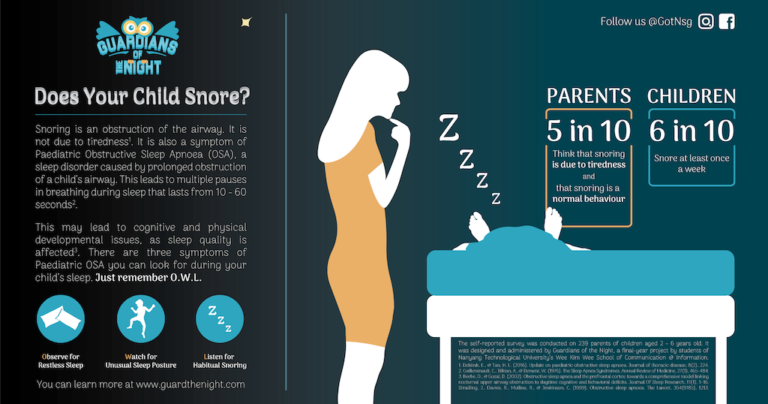 Remember, snoring is not always due to tiredness! So if you identify the above three symptoms in your child, do seek advice from a medical expert. I think My Child has Paediatric OSA. Now What? Do not rush for treatment. The disorder can be caused by a variety of problems, many of which may not be apparent at first. Also, while snoring is a significant factor in obstructive sleep apnoea, it does not mean that every child who snores has obstructive sleep apnoea. Consult a doctor (who may refer your child to an ENT — Ear, Nose, Throat — specialist). 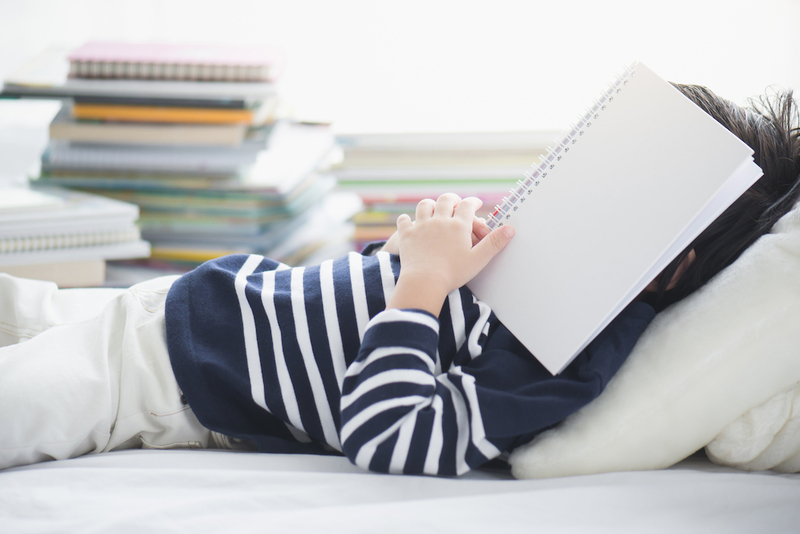 If there is need to, your child may have to do an overnight sleep test (or Polysomnography). This will allow a medical expert to determine if there is OSA, measure the severity, and identify the root cause of the problem. There are also a few private clinics in Singapore that offer these services, such as Gleneagles Hospital. We know that sleep is crucial for a child’s optimum development. Taking the O.W.L. steps can help you identify if your child has Paediatric OSA, and consequently, the behavioural problems that they may be displaying because of lack of sleep caused by sleep apnoea. Your child will finally be able to ‘sleep tight’ and sleep right. Sweet dreams! Guardians of the Night is a student-led health communication campaign focusing on raising awareness for Paediatric Obstructive Sleep Apnoea (OSA), by educating and empowering parents to identify its key signs and symptoms using the O.W.L checklist. Find out more about Guardians of the Night and Paediatric OSA at http://guardthenight.com, and follow us on Facebook and Instagram (@GOTNSG).